It was widely reported in the blogosphere that Samsung would be releasing a really heavy, really big, non-Atom Samsung NC20 netbook next month. It calls itself a netbook, but given its 12.1-inch display and 1.5kg bodyweight, this is an extremely dubious claim. Adding to this rather questionable assertion is the fact it’ll run off a 1.3GHz VIA Nano U225 chip, rather than an Atom CPU. Now here’s a bunch of specs that make it very netbook worthy – starting with a choice of HDD or SDD, WiFi, Ethernet connection, USB ports, a 1.3 megapixel webcam, multi-card reader and VIA Chrome 9HC3 graphics. And let’s not forget Bluetooth. Pricing estimators have put this one in the $500 USD category. This will be confirmed next month. 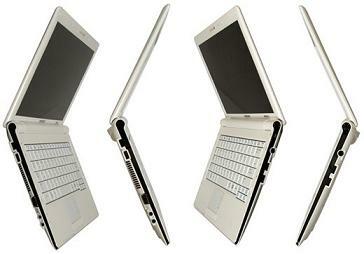 The NC10 was a reputable piece of kit, so here’s hoping Samsung doesn’t undo all that hard work by ruining the NC netbook name. So does bigger mean better? As the old adage goes – only time will tell. I am actually quite excited by the NC20. It is looking like a very slick looking piece of kit. Due to its bigger size it won’t be displacing any NC10s imo, and with a price of £400 (as seen briefly on dabs!) I think the price may put others off.